Is it the aliens’ integrity during war that keeps them from squashing the laser cannon? Billions of dollars in quarters spent. Yen shortages. Single-handedly kick-started the golden era of arcade games. Quadrupled the Atari 2600’s sales when released for the console. 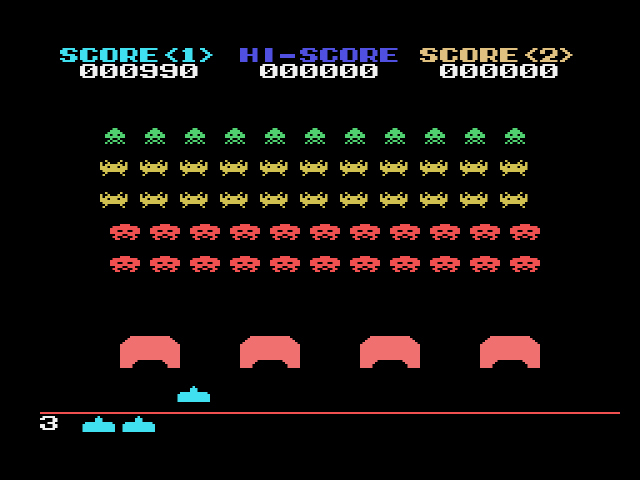 Space Invaders is one of the most successful and iconic video games of all time. And until I was forced to play the game for this review, I had never played it before. Ever. I was born in the mid-80s and started seriously gaming in the late 80s/early 90s, so it shouldn’t come as a surprise that Space Invaders was never on my radar to play. I saw it around, of course. Arcades, bowling alleys, grungy Greyhound bus stops. I knew what the game entailed: rows of alien creatures are “invading” your laser cannon’s turf, one horizontal movement at a time. Shoot ’em before they land or shoot you, then do it again until you run out of lives. All for the biggest high score ’cause that’s what gamers cared about in those days. Simple, potentially addicting stuff, but by the time I got to the arcades, I was too obsessed with The Simpsons and Street Fighter II to care. Space Invaders may have been great, I reasoned, but these other games are greater because they’re newer. I was young, inexperienced with life, and stubborn in my point-of-view: there was no way I was going to play some silly arcade game from my parents’ time. Ted Turner would be proud. It took my desire to play every Sega game on every console to force me to play Space Invaders for the first time. To Sega’s credit, the SG-1000 port is solid. The aliens, shields, and the laser cannon have been rendered in glorious Technicolor (well… SG-1000 color, anyway). The laser cannon glides smoothly across the bottom of the screen. The music, such as it is, remains tense and ominous. And the game is hard. The lasers the aliens shoot travel fast to your laser cannon’s brain. I had to train myself to move the cannon every time I saw a laser fall from the aliens’ centers, regardless of if the laser was close to me or not. Also, when that last alien came high-tailing it down in my direction, it took all my self-control not to throw the controller at the screen. Buggers move fast. I’m not ashamed to say I only reached the second level. I’m sure I could get better with time and practice, but I have no desire. Space Invaders, as well-made as it is, isn’t my game. I didn’t grow up with it. I have absolutely no memories of it. I’m coming into the game after its initial release, as an almost-thirty-year-old with about twenty five years of gaming behind me. This is not the mindset in which one loves Space Invaders. I respect Space Invaders for breaking new ground and inspiring legions of people to get into gaming as a hobby or a career, but the game was for a different generation, a different place and time. Prince makes a cameo in his custom ship. He’s worth a lot of bonus points. I imagine being in a dark arcade as a child in 1980. Rush, Led Zeppelin, and Pink Floyd are playing full-blast on the overhead speakers. Teenagers are smoking and playing games and looking cool. Crowds are gathered around various machines, including Space Invaders. I watch as someone dominates wave after wave of aliens and I think, Yes, I want to do this too. I want to be as good as this person. So I try and I fail because I’ve never played the game before, but I want to get better because Space Invaders is what’s happening. This is the type of environment I would have needed to be in to appreciate Space Invaders as an adult. The scene, the mood, and the moment in time lend itself to a deeper union with the game. It isn’t Space Invaders‘ fault that I’m a couple decades late to its party, nor is it my fault for not making an effort to get here sooner. I just got caught up, is all. Yeah, Space Invaders is tough. It’s also really stressful because, at least in the arcade version, as you kill more and more of the aliens and they get closer, the music speeds up. Which was a bug, but it was an effective bug. Interesting to hear that the music was a bug. A huge part of Space Invaders is the sheer panic it induces as it speeds up towards the end of a wave and the music adds to the pressure. Genuine classic. 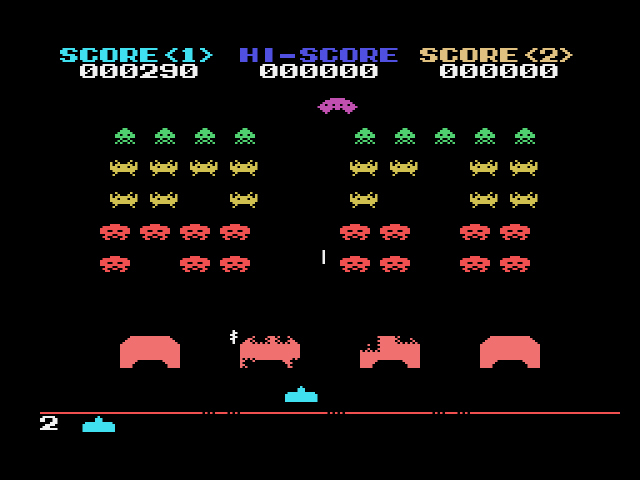 As someone who played Space Invaders on the Atari 2600 in 1980 or 1981, it was one of the earlier games, I would think by 1985 it would feel pretty dated. It was a 1978 arcade game. It was sometimes regarded as the 2600’s first killer app. I’m pretty sure in 1985 I would feel the same way you feel now. Arcades and consoles had advanced a lot by then. Really what game on the SG-1000 had an earlier heritage? Although Taito would do some interesting stuff later on with the liscense with the Gameboy and the Genesis. And of course the current Infinity Gene games. I guess the color is nice. But I kind of agree with you not really getting into the game, even in 1985. 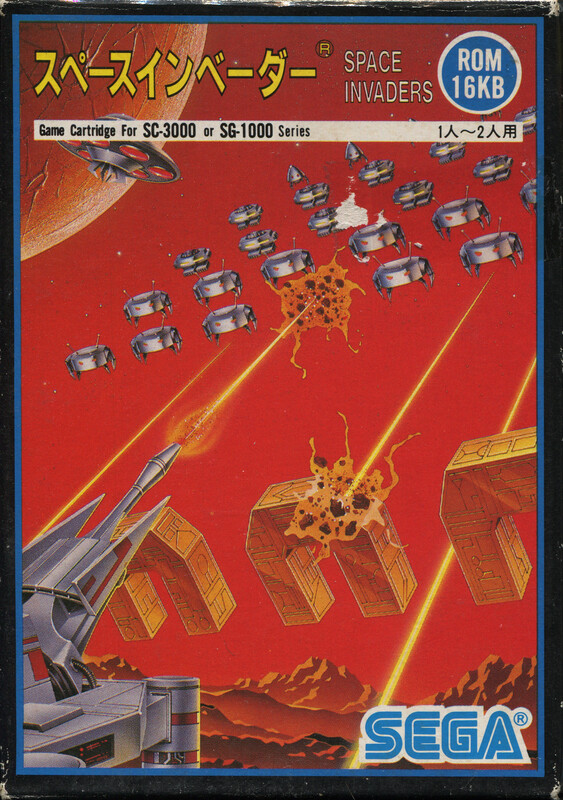 Taito also released a similar port of Space Invaders for the Famicom in 1985, even though they released Return of the Invaders (the first revamp of the game) to arcades. So, if it was a throwback, it was part of an intentional effort by Taito themselves and not Sega. Ya after reading I did some reading about home ports of Space Invaders. This and the Famicom game were the last and latest straight ports of the arcade game coming in 1985, a full 7 years after the arcade. I went back and watched Chrontendo Episode 3 for a refresher about the Famicom port, and apparently it had issues with the enemy sprite size and spacing, as well as moving your ship, that made playing it significantly different than the arcade. It’s not regarded as a very good port. This port seems a lot closer. In any case all future Space Invader Games had improvements to the original game. I really liked the Space Imvaders 91 port on Genesis as it added variable terrain and power ups and Space Invader Infinity Gene from 2009. The Genesis version was based on Super Space Invaders ’91, known as Majestic Twelve: Space Invaders Part IV in Japan, which was the then current arcade sequel. It wasn’t until the Game Boy and Super NES ports that we saw a straight up return to the original with new bells and whistles added (eventually culminating in things like Taito Legends where the emulated original was bundled with a bunch of the sequels and other Taito arcade titles). Thanks for the comments everyone. Lots of good insight and memories here.